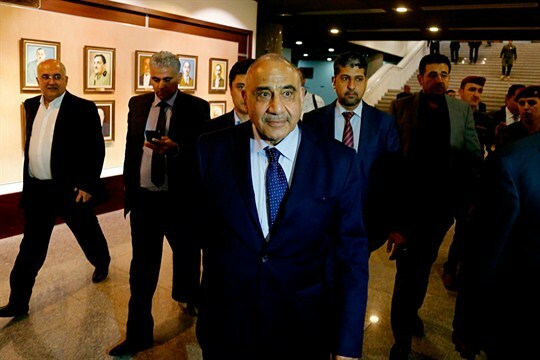 Iraqi Prime Minister Adel Abdul-Mahdi, center, leaves the parliament building in Baghdad, Iraq, Oct. 2, 2018 (AP photo by Karim Kadim). In May 2018, Iraqis went to the polls to vote for their new government. The vote was significant in some ways, in particular due to poor turnout. Iraqis seemed to be sending a message to the country’s political elite that it was time to turn the page on Iraq’s party and government system put in place for the past 15 years. But the elections were inconclusive in terms of delivering a parliamentary majority to any single party or bloc, and represented more than anything else an indictment of the political elite that has governed Iraq since the fall of Saddam Hussein.